South Bank Churches developed and held the first Pop-Up Church in 2013. Pop-Up Church is an exciting flashmob-style public event, where hundreds of people join together in a rousing chorus of the well-known hymn Amazing Grace. 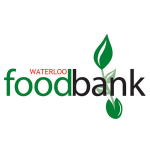 During the song, participants and members of the public are encouraged not only to sing but to contribute non-perishable food items to a Food Mountain (donated to the Waterloo Foodbank) which becomes a centrepiece of the flashmob. After the singing, a leader of a church marks the event with a prayer, and then all disperse. Go to the South Bank Churches homepage to see the video of our 2016 event. For people on low incomes, a sudden crisis – redundancy, benefit delay, illness or even an unexpected bill – can mean going hungry. Every day parents in Lambeth skip meals to feed their children and people are forced to choose between paying the rent or eating. Waterloo Foodbank exists to provide emergency support to local people in crisis by giving them three days’ worth of food. For more information on the Foodbank, click here to visit the Foodbank website. 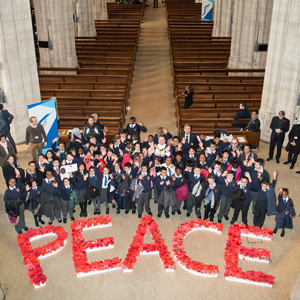 With 2014 marking the centenary of the start of World War One, this was a fantastic opportunity for South Bank Churches to facilitate bringing local together young people in an act of commemoration. Our aim was to offer young people from all our local schools the opportunity to be part of a poignant and inspiring project and an engaging way of participating in this globally-significant anniversary. We invited 20 of the closest schools in North Lambeth & Southwark to join us, and around 850 students from either Year 6 or Year 7 took part in a special commemorative Peace service, specifically designed by young people, for young people.